Elizabete Gouveia has cerebral palsy, cannot stand or sit up by herself and needs regular physiotherapy. But for the last few months she has been enjoying horse riding as part of her treatment regime. Her father Manuel, from Torres Vedras, Portugal, says the treatment - known as hippotherapy - is proving very beneficial to three-year-old Elizabete. "She is not afraid of the horse and we have found she is more relaxed after the treatment. "Her legs particularly are more relaxed and we have seen a big difference since she started the therapy. "Now she even looks forward to having her therapy," he said. The therapy, which is also available in the UK, is used to help people of all ages with different physical or psychological difficulties. Treatment involves putting patients on horseback in a variety of positions and adapting to the horse's movements and working on co-ordination and posture. Catia Roche, Elizabete's physical therapist at CampoReal, in Portugal, said she had noticed that using hippotherapy increased mobility and muscle relaxation, improved tone and decreased involuntary movement as well as boosting the rider's self-esteem. "The temperature of the horse is about 38 degrees, so their warmth helps make the patients' limbs easier to work with." She added that the three-dimensional movement of the horse's pelvis also leads to a movement response in the patient's pelvis, which is similar to the pattern of walking - something some of her patients cannot do. The rhythm of the horse at walk affects muscle tone and helps to reduce muscle spasm. The temperature of the horse, higher than that of a human, is very relaxing and helps to increase blood supply and release tight tissues. "We have been using the hippotherapy here since January, but I have been training in it for two years," she said. 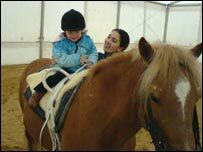 "I have really found it helps with the co-ordination and after hippotherapy they stay relaxed for longer. "After physical therapy I have found that they are relaxed for one to two hours, but after hippotherapy the benefits can last for up to five hours. "I find that people are also calmer and less stressed out, following their 30 minute sessions." She said she was currently using hippotherapy for people with cerebral palsy, spina bifida, multiple sclerosis, people who have suffered trauma and those with neurological problem. Lesley Furnell, a physiotherapist for Revive Scotland, which works with MS patients, said hippotherapy is very different from riding for the disabled, which has been around for over thirty years. She said that hippotherapy, which was first used in the 90s, is growing in popularity now in the UK and she has waiting lists of people with MS wanting to use it. "The courses have become so popular I have had to limit them to 10 weeks each, otherwise it would not be fair on the others. Everyone who does it seems to enjoy it. "It uses the three dimensional movement of the horse's hips, pelvis and shoulders at the walk to provide a movement challenge to the rider and I consider it to have been a success when the rider can replicate what they feel when they are on the horse to what they feel when walking. "Hippotherapy is a unique treatment, which cannot be rivalled or reproduced by any other therapeutic method or piece of equipment," she added. But a spokesperson for Scope, the charity for those with cerebral palsy said that although they are aware of the benefits of hippotherapy it should not be thought of as a cure. "As with all treatments and therapies, Scope would recommend caution and consultation. "There are no cures for cerebral palsy; rather it is important to promote independence and equality for disabled people. "Some people will find relaxation in horse riding, and there are benefits in the warmth and movements of the horse in improving circulation. And it can be fun and exciting for children with CP, the same as it is for non-disabled children"